Godlike started out as a project to pass our time, but through the years it became one of the best Mastering softwares on the market. It easily rivals the well-known Mastering softwares, but it maintains a reasonable and fair price. There are several excellent quality Mastering programs in reachable price, but during long years none of them developed into the expected level. This software has been brought onto the market by need, and it includes some unique functions, that you cannot find in the competition's products. Godlike 4 What is in the pack?. The program contains a lot of features, like Maximizer, Tube emulation, Multiband compressor, Equalizer, Auto Equalizer, Stereo enhancer, Mid/Side editing, Transient recovery, and standalone application. Furthermore, unlike other Mastering softwares the price is low, but the quality of the sound is high. Auto EQ. This function changes the frequency ranges' volume to more linear. After the software finds the most ideal setting, you can change the intensity. The software also has a 4 way multiband compressor and a 4 way stereo imager where the volume of the side and middle sounds can be edited. Their position in space can be changes with the Pan function, and if necessary the delay function can be used to create a greater sense of space. Tube emulation is still a basic part of the Godlike series. The feature allows the software to create fat sub and nice high frequencies unlike any other program. 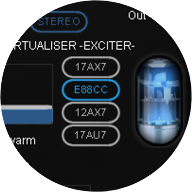 Maximizer helps with the prevention of overdrive, and with creating a higher volume for the audio. Furthermore, a comparative wav file can be loaded as well. If the user wishes to compare the tune of the mastering created by us, and the tune of any other music, this feature is the key. Transient recovery. Decreasing the dynamics also reduces the audibility of transients. This tool helps to restore transients. When difference button is on, the difference between the original and the modified sound can he heard. Stereo Imager Using Mid/Side Stereo Image Modifier you can freely change the sense of space, in 4 different frequency-ranges. Mid/Side mode optimalizes the audio sign. The pan controls are used to position a channel between the left and right side of the stereo spectrum. 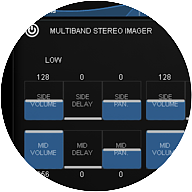 You can change the volume or stereo image with the delay function. Reverb function gives different reverbs to the 4 frequency-ranges. 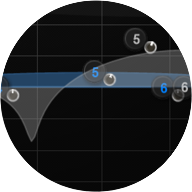 Saturation is a whole new function where the audio sign can be edited in 4 frequency ranges. 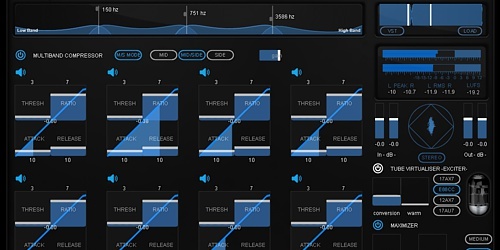 Using the feature the volume of the overtone sounds can be strengthened, and a more analog tune can be achieved. DIF: When on, the difference between the original and the modified sound can he heard. If there's no change, there's no sound. BB: the changes of the frequency ranges can be listened to separately. 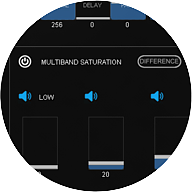 Tube emulation can bring out the maximum from music. With the help of this program, it's possible to bring out extra deep frequency without audible distortion. And when the distortion is impossible to avoid, the program makes the sound affable to human hearing. This solution is typically used by analogous technologies. It is recommended for acoustic music, in case we want to model the natural distortion of the analogue tube.